The following general principles can be used as guidelines for exhibit design and display. 1. An object should be exhibited only if its condition permits. 2. 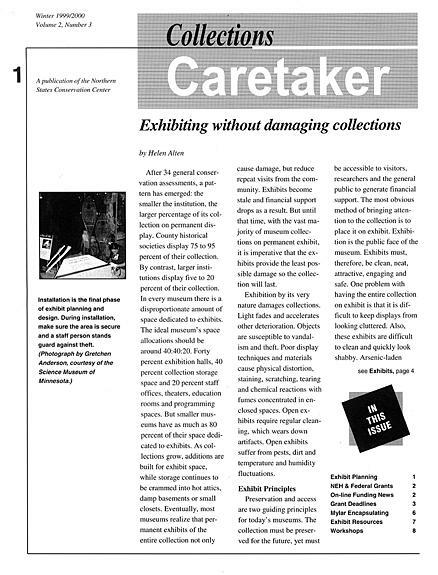 Exhibition conditions should be dictated by the most vulnerable item to be displayed. 3. Cases, supports, frames, and other display structures, and all materials used to construct and finish installations should be made of non-reactive, stable materials (such as metal). When reactive construction materials are used (such as wood), a barrier material should be placed between the objects sensitive to acid migration and the off-gassing of volatile components of various adhesives and wood products. 4. Barriers should be placed between objects and their supports. For example, Mylar will barrier an object from a painted wood shelf, polyester felt will pad and barrier an object from a metal support. If objects are stacked, as in a room display, barriers should be placed between each item on display. For example: a table with a lace cloth and a lamp. Mylar should be placed between the table and the cloth as well as the cloth and the base of the lamp. 5. Mounting systems should provide total support to the object and avoid concentration of stress on any one area. Consider gravity when designing mount systems. 6. Mounts should not scratch, cut, put holes in, or stain an object. Mounts should be padded. For example: nylon fishing line should be padded with soft polypropylene clear surgical tubing so the nylon does not cut into the object. 7. Flat textile and ethnographic items are best displayed flat. The more drastic the slope, the more stress applied to the item. For example, a padded slant board may not damage the piece, but vertical display (hanging) often causes damage over time. 8. Costumes, accessories and three-dimensional objects ideally should be exhibited on forms constructed to the proportions of the objects. For a costume, an adjustable mannequin is appropriate. Where objects need padding out, archival materials such as acid-free tissue and needled-punched polyester fiberfill, should be used. 9. 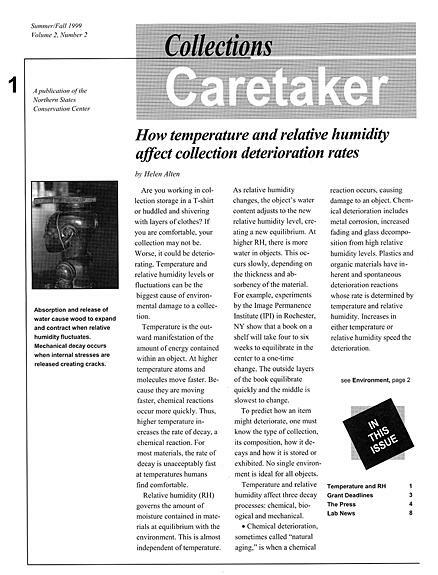 Consider heating and/or cooling sources when designing exhibits. Organic materials should not be placed close to radiators, heat vents, or air conditioners. 10. No organic material should be on permanent exhibition, constantly exposed to forces that accelerate natural degradation. 11. Do not stack items on display. Use mounts to separate each piece from the one below it. In cases, do not place materials on top of each other, this leads to differential fading, staining (when metals are on textiles) and other damage. 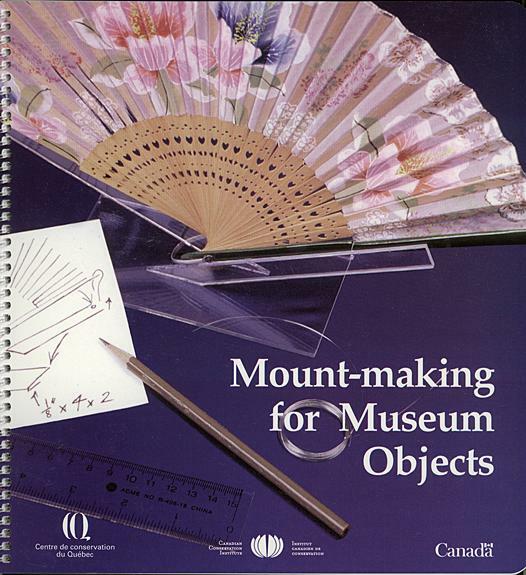 CCI Mount-making for Museum Objects by Robert Barclay, Andre Bergeron and Carole Dignard provides specific information and useful advice on the mounting of museum objects. Topics covered include reasons for creating mounts, recommended stable materials, tips on choosing materials, the working properties of materials, and methods for measuring artifacts. Objects with custom-made mounts are illustrated with photographs and line drawings. A supplier list and bibliography add to the overall quality of this book. Framework for the Preservation of Museum Collections Wall Chart outlines various methods that can be used to avoid or control potential deterioration of museum objects. The rows list nine agents of deterioration (direct physical forces: thieves, vandals, displacers; fire; water; pests; contaminants; radiation; incorrect temperature and incorrect relative humidity), while the columns present three different levels at which the agent deterioration can be controlled. The procedures column outlines actions that can be taken. English/Spanish. 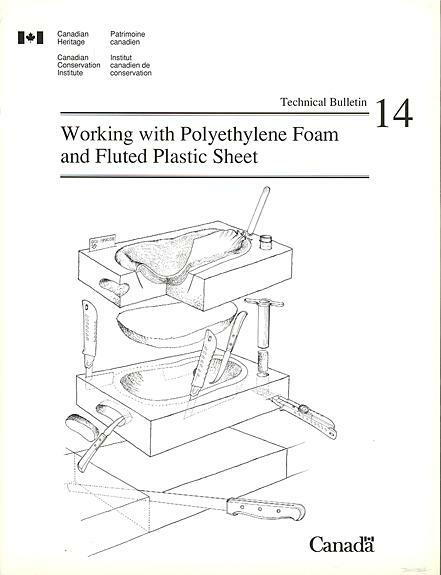 Examines several techniques and illustrates a series of basic approaches that have been developed for working with polyethylene foam and fluted plastic. The many detailed illustrations clarify for the reader the fabrication methods described in the text. Exhibit Label Basics, Part 3: Content.